A longstanding curiosity in the investment business has been the disinterest in precious metals among institutional investors. Whether from the handful of consultants now leading the institutional space, or directly from the stewards of our nation’s pension, endowment, and family-office wealth, skepticism over gold’s portfolio relevance remains fairly pervasive. Because investment professionals are generally well informed, competing in an industry in which performance is king, one would assume any asset class deserving of rightful consideration would enjoy a fair hearing. Eight years of zero interest rate policy (ZIRP) have compressed returns across a wide spectrum of institutional investment regimens. Especially in the pension and endowment world, few portfolios are achieving chartered rates of return. In this environment, we find it puzzling that institutional investors still choose to ignore gold’s market-leading returns. As shown in Figure 1, gold has generated positive annual returns in 14 of the past 17 years. What is even more impressive is gold’s performance compared to the S&P 500 Index, the benchmark for broad U.S. equity performance. Gold’s compound annual growth rate (CAGR) for the 16.75 years (2001 to September 30, 2017) stands at 9.68 percent versus 6.01 percent for the S&P 500 Index (dividends reinvested). Indeed, it is fair to say that since the turn of the millennium, any long-term allocation to gold would have improved total returns for the vast majority of pension and endowment portfolios. Source: Bloomberg; S&P 500 Index returns reflect reinvested dividends. Now that the S&P 500 Index has almost quadrupled from its March 6, 2009 low (666.79), few plan sponsors would equate gold’s potential portfolio “alpha” with that available among U.S. equities. However, as shown in Figure 2, the S&P 500, measured in gold terms, remains 64 percent lower today than at its 2000 peak! 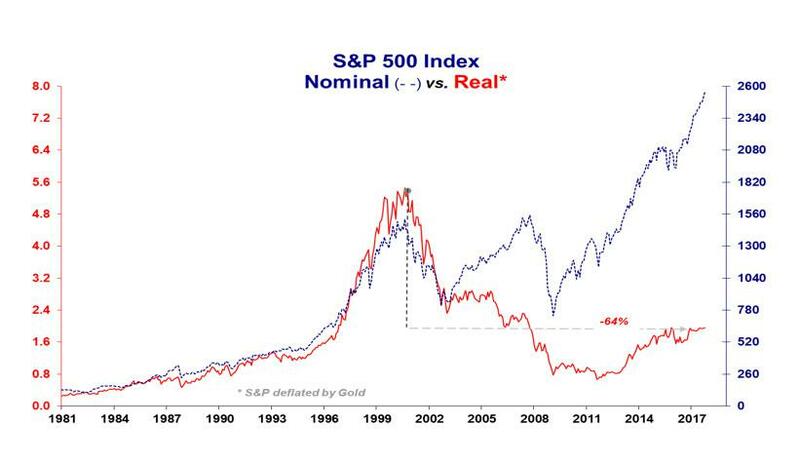 During the past two corrections in the S&P 500, during which the index declined 50.50 percent (2000-2002) and 57.7 percent (2007-2009), gold provided unrivaled protection of real purchasing power. We are aware of no reasoning to suggest gold’s portfolio-protection benefits will prove any less potent during the next correction in U.S. equities . In fact, the slopes of the lines in Figure 2 suggest gold’s portfolio-insurance value has rarely been more compelling. As the investment advisory business has become more scientific, amid increasingly frequent financial shocks, the holy grail of portfolio allocation has become the overarching search for non-correlating assets. Methodologies for identifying and measuring non-correlating assets are in no short supply. However, a routine calculation employed by contemporary risk managers is stress testing portfolio components under simulated conditions of both positive and negative economic trends. As shown in Figure 4, gold’s correlation to traditional asset classes remains uniquely low during periods of both economic expansion and contraction. In other words, gold’s portfolio-diversification benefits are not solely dependent on bad news. Even more challenging to industry status quo, gold bullion has rivaled the performance of alternative asset indices while simultaneously displaying far lower correlation to these vehicles than either stocks or bonds . As shown in Figure 6, the correlation between prominent alternative asset indices and the S&P 500 Index has averaged 81 percent over the decade through September 30, 2017. By way of comparison, the 10-year correlation between these same indices and spot gold has averaged just 10 percent. Sprott Global Resource Investments Ltd. is a wholly-owned subsidiary of Sprott Inc., a public natural resources investment management firm listed on the Toronto Stock Exchange (Symbol SII). Sprott Money is pleased to bring selected writings from the financial experts at Sprott Global to our readers from their newsletter, Sprott's Thoughts.